If you want the perfect Nerf Christmas present for the foam-projectile lover in your live, you've come to the right place. These glorious Nerf blasters come in all shapes and sizes, from the sublime to the extremely ridiculous, so there's the ideal pick for you. Some will probably get discounts after Christmas, so be sure to visit our best Boxing Day sales pages. The sheer volume of Nerf weapons available has left many justifiably confused as to which blaster they should add to their arsenal, or trust their children with. This is where we step in - check out our list of the best Nerf guns below. Our faces ached with joy after initial experiences with the first in the Rival range last year, with the 30 MPS velocity sending soft(ish) spheres further and with more accuracy than the foam has ever achieved before. Basically, Nerf felt all grown-up. Unleashing all this ammo at high speed was satisfying, but retrieving it was not and never will be. Indeed, loading up an earlier version of a Rival was/is annoying, which is the polar opposite of what it needs to be. This time, a open chamber just allows you to pour in your yellow spherical perils at speed and return to annihilating the enemy super fast. Adversaries will no doubt soon bore of your dominance, but if that happens you can always set up some sweet trick shot sessions with this grin bringer. There are a number of sets in the new Nitro range; they must have named this one though whilst the over-enthusiastic Nerf naming team were on an away day. Aimed at extending the appeal of the brand this new foam-car-launching-system uses the motorised air-chamber to hurl out the cars at a decent speed from the blasters ramp. The cars are equipped with more sturdy and speed worthy plastic wheels and so achieve decent distances - wood and lino is best, short office style carpet is fine, anything else will chafe the low-clearance chassis slowing it significantly. This top-of-the range set comes with nine cars, ramps and a bunch of obstacles for you to line-up and smash up, there are smaller sets in the series with shrunken down blasters and a few different accessories including the rings of fire. Introduce household items to extend your targets further upwards for more satisfying collapses. The more sniper like look of the Accustrike range is no mistake, as it has been developed for those on your crack squad who like to sit in secret and take pin-point pot shots at opponents fairing far too well in the field. If not for this reason then you should own an Accustrike FalconFire as, with a modicum of practice, you should well be able to win target based bets as the darts are most certainly superior. Designers spent over two years on the dart design and, as a direct result, they’re better balanced with a redesign that gives improved airflow and aerodynamics. The result = increased accuracy. Hugely popular since its launch the Modulus range allows over 100 different combinations of blaster to be created - if you own all the accessories of course. This Regulator unit brings the ability to do that but with a new way to unleash those darts – SwitchFire. Flick between one of three modes by the trigger and go from C battery powered single shot, semi-automatic pew, pew, pew, and full-auto (magazine depletion in seconds). There is also the addition of a light to indicate you’re out of ammo, and an accessory that enables you to blast from the hip in some Rambo-esque fashion. When partaking in H2O based fracas it really is the element of surprise that makes the difference. After a while, most participants in a water war will be conditioned to the tepid temperature of your refill, so you need to add some added freeze power. Throwing ice cubes will only infuriate opposition so this blaster with its extra-wide loader for added cubes, as well as water, means that when you pull the trigger the liquid is super chilled for big shock factor. This is a pump-action water blaster small enough to conceal as secondary arsenal and about the best piece of kit for unleashing a short, sharp shock on the unsuspecting. The faux bandaging, plier-shaped handle and the goalkeeper hues combine to create a cracking looking blaster here - a five-barrel rotating action number powered manually by pulling back on the scissor-styled handles on top. Added quirk comes in the form the the bow appearing to unleash the darts each time, this isn’t the case though and you can take this piece off. If it is a cylinder style action you’re after then the Nerf Strongarm (see below) has a superior action but brand awareness amongst zombies of this particular range of blasters might be less likely to take you seriously if you’re not brandishing one in these colours. Scoring highly on the intimidation scale a foam dart needn't be fired before the opposition has second thoughts. Staring down the barrel of the Mastodon you're stuck with the sheer size of it, and at that point possibly wondering why you are looking down the business end. It is one of the first automatic blasters that fires off the Mega darts, it does so at an impressive speed driven by the addition, at your expense, of six D batteries – it doesn't seem battery technology has lent itself to drum rotating blasters. A price cannot be placed on the child-like grin induced upon unleashing the 24 dart drum and enjoying the whistle they make as they head to your intended target. We very much would've liked to be in the meeting where they named this number, we're thinking it was late Friday afternoon, sun shining outside, two execs at Hasbro shouted a couple of random words – done deal, packaging sent to printers and its pub o' clock. This double-barrel blaster can be floor/desk mounted for accuracy or stick the stock into your side and walk directly towards your target with swagger. Both intimidating and impressive the Rhino Fire achieves decent distances, the downside of this is picking up the contents of both 25 dart barrels you've expended. A decent enough looker to keep out on show – shelf-candy. The latest adaptation of their projectiles come in the form of these spherical numbers for the new range of fully-automatic blasters in the Rival range. At first glance the colours and design of this new range point at a more grown-up approach and with a travel time of over 60 mph these balls mean business. Distance-wise, 75-80ft every time. 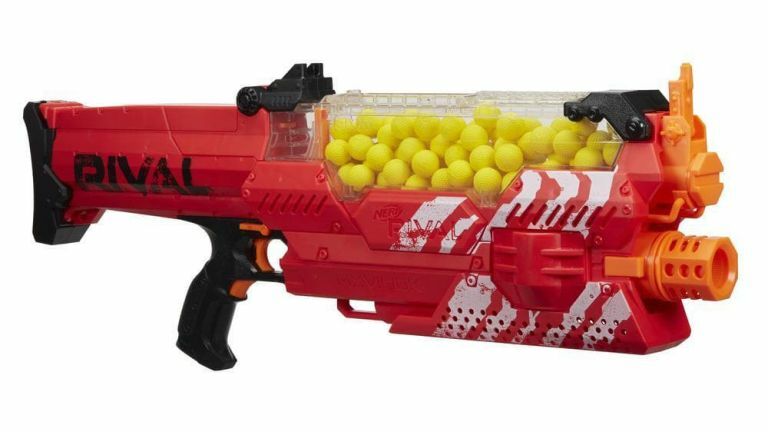 The standard blaster comes with a 12 ball barrel, you can, and should buy both extra barrels and plenty of extra balls. In addition to exceptional accuracy in battle shape of the ammo lets you mess about with trick shots against walls and ceilings to reach your target. The latest arrival on the Nerf scene is an extension to the Modulus category. Multiple tactical rails and accessory sets you can mix and match these blasters into over 1,000 different combinations. This model is able to blast regular Nerf projectiles plus the MEGA ones and also the missile variant, which, with some practice can travel around 30 feet – And your intended target will feel it. Released about the same time as series two of the Walking Dead, just before its started to get really dull, yes, just then. The Zombie range of blasters was largely average with this one, the Slingfire, a standout success. It may only have a six-dart capacity magazine but it it the way you flick down the lever to load up your air power that impresses. A modicum of practice and you'll be able to perform this one-handed and then for hours you'll be doing little else. It is easy to arm up the air chamber at the rear in super-quick succession on this often overlooked blaster. This is a superb six-dart shooter that is about one of the best in the manual line-up and unleashes with excellent accuracy and achieves impressive distances. An absolute must have in any Nerf arsenal as a back-up blaster for cover. There are also tactical rails atop this one should you decide to accessories with other elements. This deceptive single-shot, manual-powered blaster is one that you really shouldn't travel anywhere without. A superb quick-fix for when you eye a target on your daily grind for a pot shot and one that can be secreted about your person easily when your opponents are acquiring your arsenal, your last-chance-at-the-saloon-shooter. For a blaster that punches above its weight for both distance and power this one is unsurpassed. Unlimited ammo? You better believe it! So, whilst the sun has his hat on it is certainly time to invest in a water blaster. The Super Soaker range isn't the most wallet friendly range around, but, for H20 delivery toward target and with pressure unbranded units just won't do. Pump up for action, a steady stream of ammo is delivered but a major surprise for retaliators returning with you back to base for a refill. This one connects up to the hose for unlimited ammo, also a fun way to water the plants. You'll have seen those manual tennis ball flinging things in the park, some say a lazy way to exercise your pooch, we disagree, this is much lazier. A spring-loaded blaster that'll send your sphere distances approaching 50 feet, much to the envy of other dog owners. So long as your canine is versed on the fetch and drop technique you don't even have to bend to pick up the ball, just dunk the end of the blaster over it and its done. Looking for the worlds fastest manufacturer produced foam dart firing machine? Here it is, Hyperfire by name, etc etc. Unleashing five darts per second from its 25 dart chamber it'll not take any Carol Vorderman scale academics to figure out you'll be spending plenty of time on the Nerf trail picking up so ensure you've a back-up stash. The deluge of darts it rains upon your target is rapid enough to send them into a mild confusion for a while affording you some extra time to reload. The best Lego sets 2019: Bond, Star Wars, Lego Movie 2, Harry Potter and loads more! The best remote control helicopters 2019: get to da choppa!